Over two hundred years ago, up to the period when East India Company occupied Odisha in 1803 A.D. and Nilgiri came under the reign of East India Company in 1807, there was no record of visiting Panchalingeswar or Ahuti valley by the then King Mandhata Ramachandra Bhujanga Baliar Singhdeo Mardaraj Harichandan. In 1811 A.D. his son Gobinda Chandra Mardaraj Harichandan was enthroned as the next king.Although he was a religious king and had built some of the temples,such as the Jaga Balia Temple at Mukundapur, there is no evidence of his patronage for Panchaligeswar or Ahuti valley. He reigned from 1811 A.D. to 1848 A.D. After his death,his son Krishna Chandra Mardaraj Harichandan was enthroned in 1849 AD. His queen, Arnapurnna Devi,had a dream in which Lord Shiva ordered her to worship his five Phallus symbols engraved in a grove in a pit of flowing stream of water in east of Ahuti valley. The queen narrated all the details she had dreamt to the king. 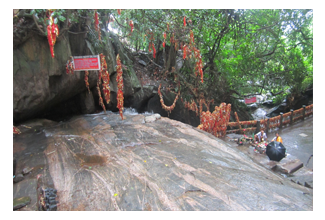 The king with his courtiers, counselors,and minister went to Ahuti forest, as per the instructions dreamt by the queen,and searched for the 5 Shiva lingams. At last he got success in relocating those emblems of Lord Shiva. All shouted and uttered the slogan 'Jay Baba Panchalingeswara'. From that day onward the name of that place is Panchalingeswara. The king worshiped the emblems and made all sorts of arrangements for the adoration of Baba Panchalingeswara. He appointed the late Bihari Kar of Basudevpur as the first priest for worship. 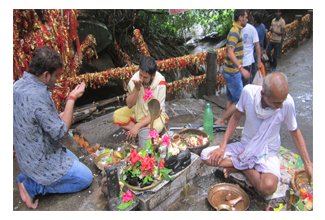 From that day onward, people have been worshiping the Panchalingeswara, which once had been hidden for centuries.